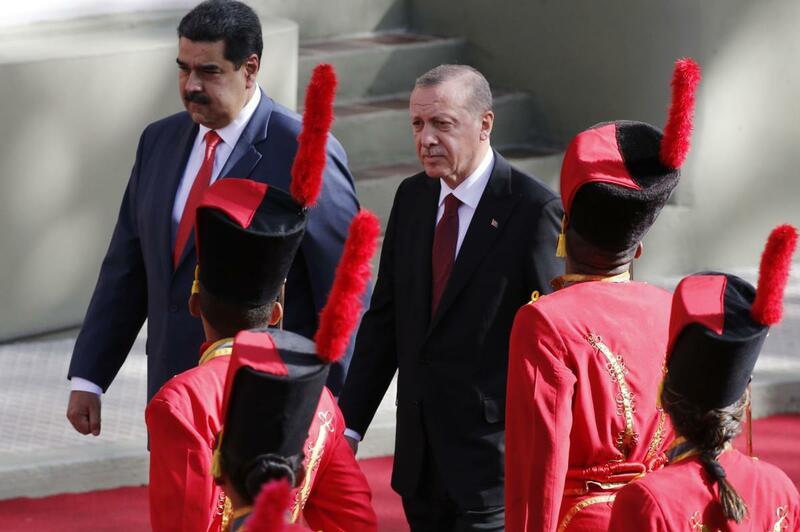 Erdogan took the stage with President Nicolas Maduro in the first visit by a Turkish leader to Venezuela. He stopped in Caracas after attending the Group of 20 summits in Argentina. The Turkish president said Venezuela's government has been unfairly hit by international sanctions amid its economic crisis, punishing an entire nation. The United States and several European nations have sanctioned Maduro's administration in an attempt to pressure Venezuela into making a return to democratic ways. “I think Mr. Maduro's exemplary attitude is very valuable at a time when enmity toward Islam has risen and Western countries are stoking hostility toward foreigners,” Erdogan said. Figures from the Turkish Statistical Institute say that in the first nine months of the year, Turkey bought $900 million in gold mined in Venezuela - revenue that has helped replace the government's crashing oil revenues. U.S. sanctions also target Venezuela's gold sales, but Maduro defiantly said that won't stop him from continuing his country's newfound trade with Turkey. Video clips on social media went viral showing Maduro eating prime meat, smoking a cigar and posing for photos with the restaurant's flamboyant celebrity chef while people back home struggle with widespread food shortages.